If you somehow still have it installed, get it off your machine pronto. Back in the day, a not-insignificant number of Windows users ended up with Apple's Quicktime software installed on their computers, thanks in large part to iTunes. It's been a long time since it's been necessary for either the web or iTunes, though, and as such the software is pretty out of date -- not to mention a security threat. 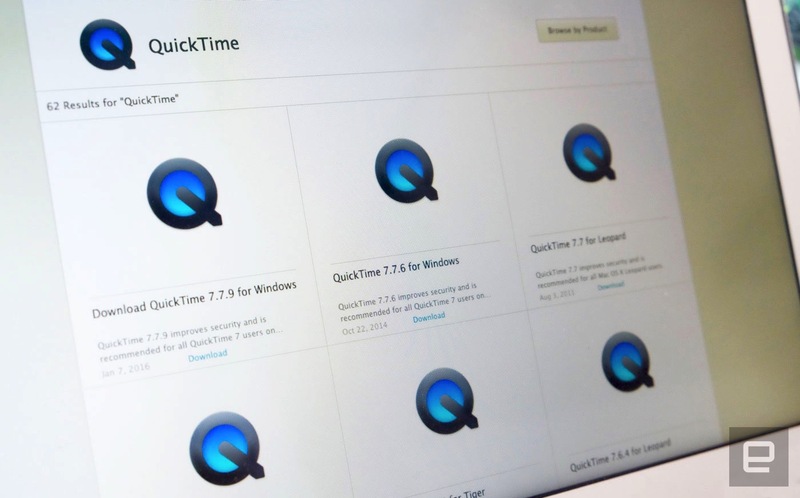 Last week, the Department of Homeland Security recommended Windows users uninstall Quicktime because of potential security holes, and now Apple is echoing that advice.The Wall Street Journal reports that Apple has confirmed it'll no longer update or support Quicktime 7 for Windows. Details to remove the offending software from your computer can be found here. As Apple notes on its support page, it's been a long time since Quicktime was necessary for iTunes -- that changed with version 10.5, which was released way, way back in October of 2011. And while Quicktime used to serve up a web video, it's similarly been deprecated and replaced by technologies like HTML 5. So for most users, there's basically no reason to have the app installed anymore. Given its status as a potential security threat and the lack of any updates coming from Apple, we'd go so far as to say you should get it off your computer as soon as possible. We've reached out to Apple to confirm that it has ended support for Quicktime on Windows and will update this post with any other details.